This backpack tote bag converts into one or the other with a quick tug of the straps—and keeps you seen in low light, too. Lightweight but sturdy, the cotton and rip-stop nylon exterior is water-resistant and tough enough to hold your essentials with a highly-reflective material on the straps. 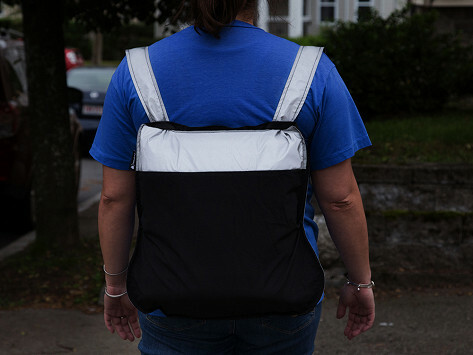 When you’re not using Notabag, it folds down small to store in a purse or glove compartment. Next time you need to carry something while cycling or on a dusk-time stroll, unfold it and you’re good to go. Dimensions: 17.7" x 25.6" x 0.1"
Use it daily for work. Notabag is actually two bags in one—a backpack tote bag, if you will. It goes from lightweight tote to lightweight backpack with a simple tug of the straps. Although it weighs next to nothing, the exterior is a mix of cotton and water-resistant rip-stop nylon that is tough enough to carry your essentials (think: quick grocery run, a trip to the farmer’s market, or a day of touristing around). 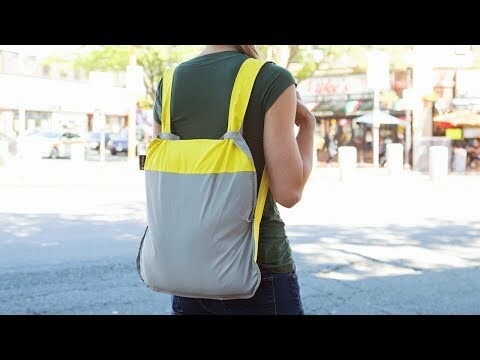 When you’re not using it, Notabag stays compactly out of your way. Keep it in another purse or your glove compartment, and forget about it until your next adventure. It unfolds and slings over your shoulder(s) on command. Inside, a protected pocket holds your wallet or keys. And if you’re cycling or walking in low light, one of the designs is made with high visibility reflective material. Notabag packs light and adapts to your needs, making it a great travel companion for small errands and big journeys alike.